Want to quickly see how the open-source software Etomite works? You'll find a free and updated demo installation of Etomite here. We are currently updating the Etomite demo. Please check back shortly. There will be a new version up soon. 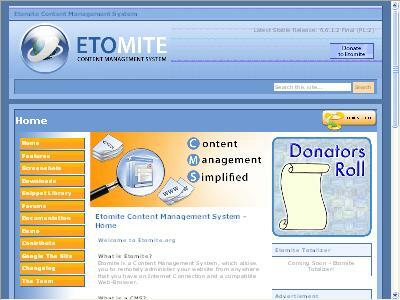 Etomite CMS is a free open source content management system developed using PHP as a programming language and a MySQL database to store information. It was designed to offer anyone in your organization the tools they need to do their job without having any knowledge of HTML or other Internet Markup language. Etomite CMS is the cornerstone of MODX content management system. In 2004 Raymond Irving and Ryan Thrash developed a mashup of DocVars for Etomite, and in March 2005 MODX officially became a fork of Etomite, when all references to “MODX” were removed from the Etomite forums. While Etomite CMS is no longer being developed and maintained, MODX is a successful content management system that brings a lot of new features to the table and is actively being supported by its community. If you want to see how the Etomite fork looks like today you can click here for a MODX demo and more information about it. 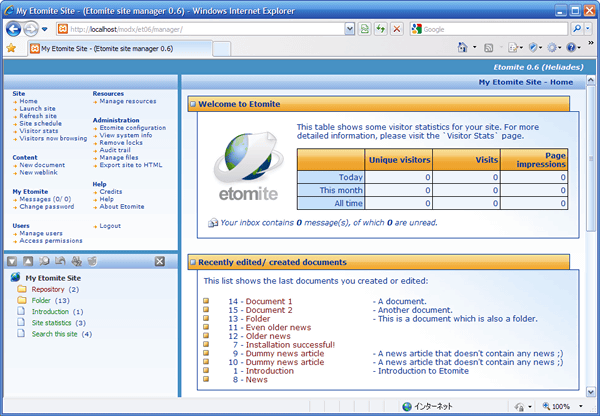 However, if you want to set up your own Etomite demo and get a review of its features you can still download the content management system from Github. After you read the documentation and go through the installation process, login to the admin demo to get a preview of what this content management system can do. One thing that you’ll notice on your demo site is that Etomite doesn’t come with any of the modules you’re used to, such as galleries, forums or other similar modules. However, the system offers some flexibility and you can extend its features using Snippets. The screenshots below will give you a preview of how an Etomite demo site looks like. You can also change the appearance of your online demo using themes. It comes with a default theme installed, but you can also create your own. The latest version available for download is 1.1 and was released on May 10, 2008 by Ralph A. Dahlgren.